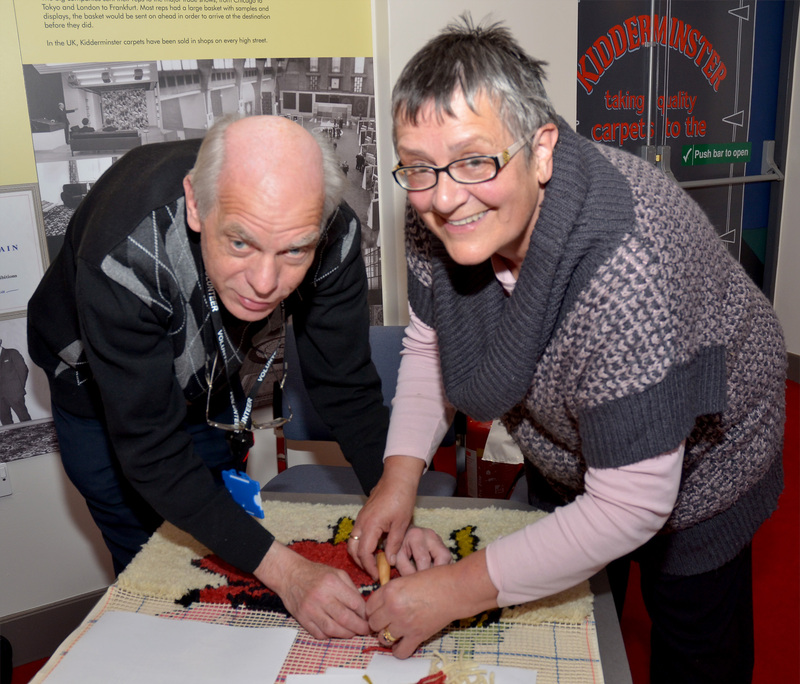 Staff at the town’s Museum of Carpet are calling on crafty locals to come along and add a stitch to their commemorative rug which is being completed as part of the World War One exhibition In the Firing Line. The rug is being created by a team of volunteers lead by Jill Edwards who are diligently adding tufts to the rug each day that the exhibition is open. Visitors are being invited to make a contribution to the rug by adding one of the prepared wool tufts into the poppy image. 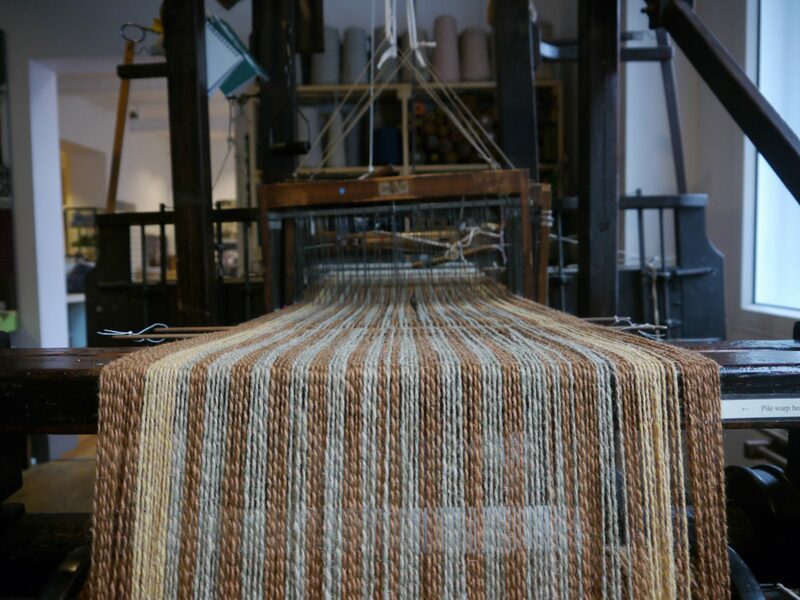 With over 10,000 tufts to be added, the rug is expected to be completed by the time the exhibition ends on 19 December. The inspiration for this design came from an item in the Tomkinson’s Design Cupboard which is now held at the Museum. When in the 1980s and 90s the various carpet manufacturers around the town began to go out of business, their archives were handed over to the Museum. Amongst all the various papers, books and records relating to the business, there were a wide range of design papers and inspiration sheets. Companies sourced these to provide inspiration for their design teams to draw on. Designs included all sorts of images including flora and fauna such as the poppy. The poppy design from the “Decorative Flower Studies” series, were floral prints by Glasgwegian Art Nouveau artist, Jeannie Foord who produced this in 1901. She drew two separate collections and these were used in a wide range of products such as fabric, stained glass and carpets. Part of the Arts and Craft movement, Foord produced the inspiration drawings to give design students an accurate representation of flora, which they were unlikely to obtain first hand. The designs were printed using the pochoir technique – a method of colouring prints using a stencil made of thin sheets of copper, zinc or aluminium that leaves part of the colour exposed. Single layers of colour were then added to the lithograph by hand using a brush called a pompom. The image was translated for the rug design by Mick Lowe a former carpet designer, who is currently a volunteer at the Museum. The wool for the project was donated to the Museum as well so this project is truly making use of the Museum’s resources to commemorate World War One. In the photograph, Graham Kitchen, Museum volunteer, shows museum visitor, Nicki Griffiths, how to add a tuft.